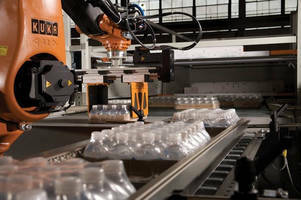 (CINCINNATI) Intelligrated® (www.intelligrated.com), a leading North American-owned automated material handling solutions provider, is exhibiting at EXPO PACK Mexico 2012, June 26-29. Intelligrated will showcase its robotic material handling solutions, including the Alvey® 950 series hybrid palletizers, as well as its established service and support network in Mexico. The Alvey 950 series, currently installed in Mexico, integrates robotic arms for pattern forming with a conventional high-speed palletizer, increasing pattern flexibility, facilitating quick line changeover, and enabling fast, easy product configuration. Ideal for reduced secondary packaging applications and small products, the Alvey 950 maintains the integrity of the finished product at speeds once only thought possible from a conventional machine. To support the region, Intelligrated has invested in significant growth initiatives, including the opening of a Mexico City-based spare parts fulfillment center, additional technical sales and aftermarket support staff, and a Spanish-language website. "Intelligrated's involvement with EXPO PACK Mexico demonstrates our continued growth and investment in Mexico and Latin America," said Julio Rubio, director of Intelligrated's Mexico operations. "Our presence in Mexico ensures local customers receive the latest material handling solutions with the best customer service and support." For sales and marketing information, please contact Emily Smith, senior marketing coordinator, Intelligrated, by phone at (513) 881-5239 or by email at emily.smith@intelligrated.com. Intelligrated (www.intelligrated.com) is a leading North American-owned, single-point provider of automated material handling solutions with operations in the U.S., Canada, Mexico and Brazil. Headquartered in Cincinnati, Intelligrated designs, manufactures and installs complete material handling automation solutions, including conveyor systems, IntelliSort sortation systems, Alvey palletizers and robotics, Real Time Solutions order fulfillment systems, warehouse control software and advanced machine controls - all supported by 24x7 Customer Service and Support.